FACTORY78: EVENT: True Nigerians Awards 2018 set to reward legacies & heroes of our time. EVENT: True Nigerians Awards 2018 set to reward legacies & heroes of our time. True Nigerians ( Heroes of our time) is all about Nigeria as a country and Nigerians as a nation with great people either rich or poor; who are role models worth emulating, personalities who have excel in their different field of endeavors, directly or indirectly made impact positively to the growth of Nigeria and Nigerians as a nation. We believe that celebrating our role model will no doubt educate and encourage our youths to emulate in ‘doing the right thing’. True Nigerians Awards is convened by Veteran brand artiste & Human Right Ambassador "Zaaki Azzay" to celebrate positive minded Nigerians rich or poor who have contributed positively to the growth and development of Nigeria as a country and Nigerian as a people. Personalities whose legacies speaks volume, worth emulating and has so far formed our socio-cultural life. This year 2018 edition is set to be staged at Sheraton Hotels , Abuja , Nigeria on the 27th of November , 2018 by 4pm. 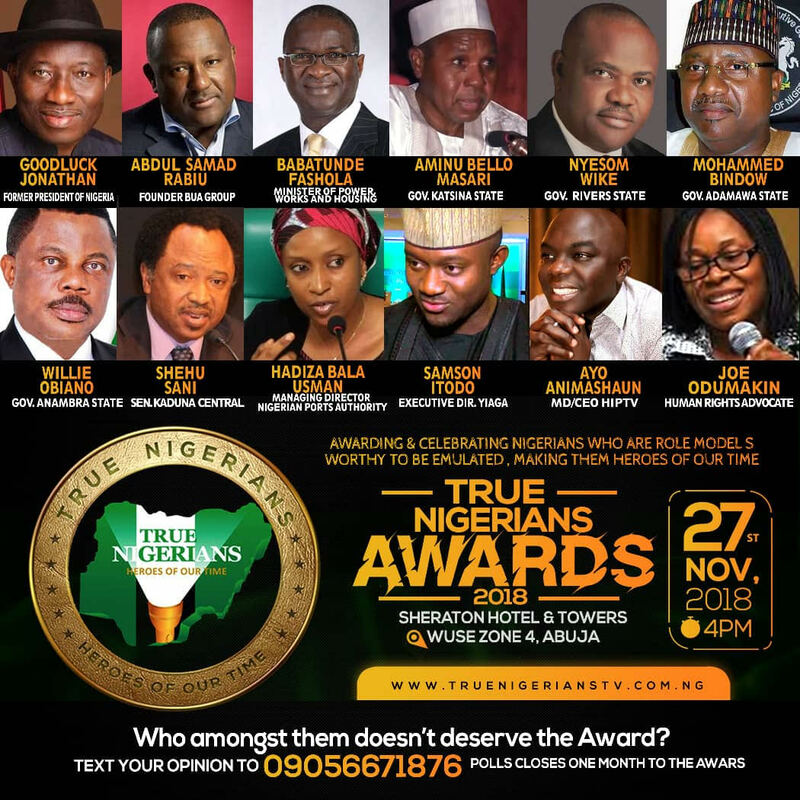 Amongst top and influential personalities who have been selected for #TrueNigerianAwards2018 include Nigeria's Former President Goodluck Jonathan, Abdul Samad Rabiu (Founder BUA group), Babatunde Fashola(Minister for Power, Works &Housing ) , Aminu Bello Samari ( Kastina State Governor), Esenwo Wike(Rivers State Governor) , Mohammed Bindow ( Adamawa State Governor) , Willie Obano ( Anambra State Governor) , Ayo Animashaun(CEO Hip TV) amongst others. This event promises to be memorable, classy & leave a positive momentum.